The world of house clearance can be a daunting one if you have never utilised the skills of a specialist company before. Many assume it will be incredibly expensive or that their unwanted belongings will end up somewhere they shouldn’t. If you want peace of mind, get in touch with Away With It today. As fully licensed and insured professionals, you can rest easy that whatever is removed from your abode is being dealt with ethically. Furthermore, we actually recycle 80% of everything from our house clearances. If you want affordable and efficient house clearance in Clapton, find out more today. 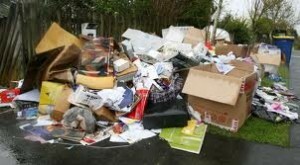 Many people assume that their house clearance job may be too big or too small for certain companies. This is where we are different! 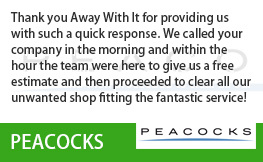 Whether you have one annoying item or an entire family home you want to clear, we are the team for the job. 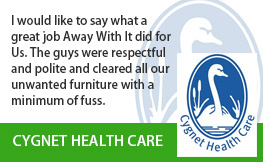 Also, as the items are non-hazardous, they can be removed by our team of experts. 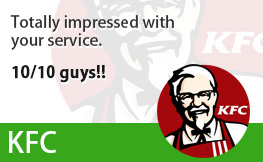 Additionally, you will always receive the best price when you select a service with us. 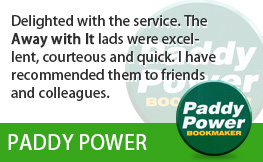 Many of our customers are always impressed with how well our quotes fit into their budget. Unlike other companies, we charge by volume of waste removed, not by “load”. 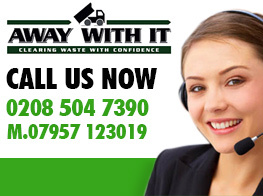 This often guarantees that our house clearance services are far more cost-effective. Too often, as customers, we hear ‘we will try and squeeze you in’, ‘we aren’t available then’, ‘sorry we are fully booked’. You will never get this answer from Away With It. We believe our services should match your requirements perfectly and we will go above and beyond to ensure this happens. We always fit in seamlessly with your plans. For this reason, we offer quotes and collections seven days a week, from 7am to 11:30pm. 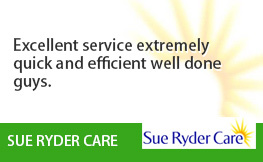 As a result, no matter what your plans, we can fit our service to your specific needs. 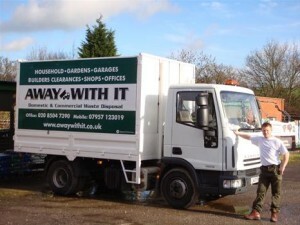 Never will you have to take a day’s holiday or wait all day for your house clearance service. Away With It will always make solid plans with you in advance, detailing specific arrival times and any other pre-clearance requirements. This means we always clear your house at the best time for you. Want to get the ball rolling and find out more about our house clearance service? Give us a call and one of our friendly team will be able to answer any queries you have and guide you through the process. 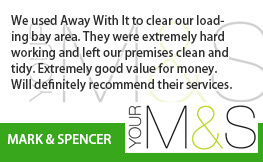 We can arrange a time most appropriate with you to give a no obligation quote and, if you’re perfectly happy, we can then organise a date and time best for you to clear your house. To discuss house clearance in Clapton call 0208 504 7390 now. We are open seven days a week, from 7am to 11.30pm and are ready to take your call.